After many hundreds of hours spent thinking about tailoring, I’ve got a new favorite tailor — he is on time, makes clothes that fit, and he is not creepy (according to one of my friends). 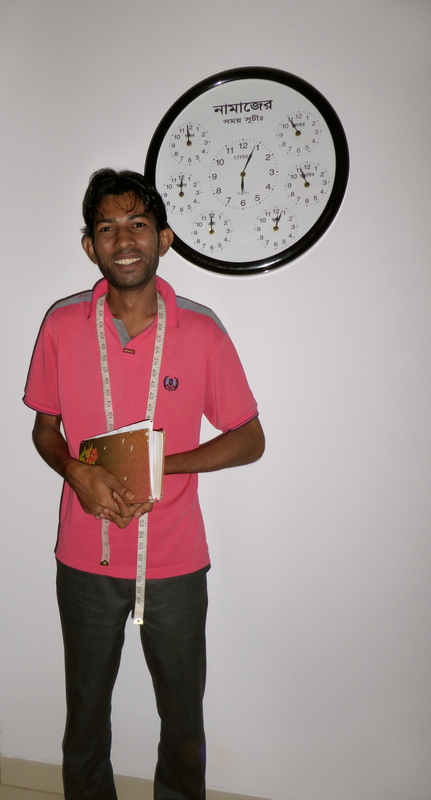 Getting tailor made clothes is a normal pastime in Dhaka. It’s part of every day life for the Bangladeshis (although there are also retail shops where you can buy ready made clothes), and as an expat, this will most likely become a part of one’s daily routine as well. Previously, Juhl/Jewel, Juhl DIT 1, was my favorite but after he got too busy last summer, I ceased going to him. Now, the tailor comes to my house — Tailor Johnny! He is the nephew of Al Babar tailor also located in DIT 1 and he is the tailor known for his halloween and glitterball costumes. 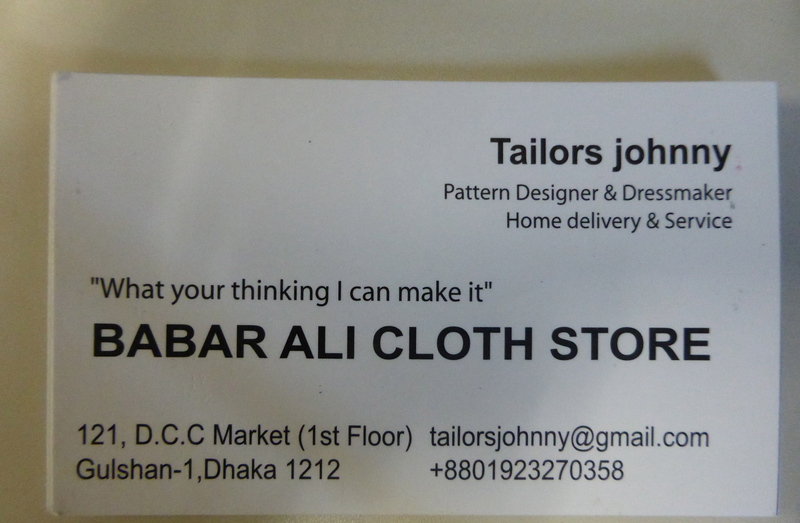 Give Tailors Johnny a call. Tailor Johnny speaks enough English to understand basic tailoring requests (plus he text messages in English which is useful) but works best from a photo or a sample. But, he can actually measure you and make clothes from those measurements. He is the ONLY tailor in I have found who does not make the clothes too tight. Plus, he can also make mock-ups of your suits etc. and then use pins to adjust it to fit perfectly (this may sound like no big deal — they do this in Thailand and elsewhere at tailor shops — but in Dhaka, this does not happen so it’s rare to find someone who actually can “tailor”). Tailor Johnny is also punctual. This also sounds like no big deal but it is. His prices are not cheap (for Bangladesh) as pants/trousers, fabric and make cost runs about 1,000 Taka ($13) and adjustments to existing clothing runs about 700 Taka. One of the few drawbacks about finding and publicizing about a good tailor is that he may get too busy. The tailors get busier during Ramadan so it can take longer to get one’s clothes back. Most tailors take a few days to a week to finish a project. But, during Ramadan, it can be weeks to months. The other busy time of the year for tailors is December-January which is wedding season in Bangladesh. Unlike in Hoi An, Vietnam, most tailors in Dhaka cannot mail you clothes. I hope that Tailor Johnny can handle the publicity that his reputation is getting him. What you thinking I can make it. What your thinking i can make it.